The Hitchcockian device of the “wrong man” appears in his 1959 spy thriller North by Northwest. This plot device can be seen in several other movies he directed, such as The Wrong Man, Saboteur, and The 39 Steps. Due to its prevalence throughout Hitchcock’s works, some scholars, such as Stanley Cavell in his essay appearing in Critical Inquiry, have come to recognize it as the “typical-Hitchcockian narrative” that first appeared in The 39 Steps and gradually evolved through the years. The goal of my paper is to examine how the plot of North by Northwest is driven by this device and its role in character development. I will also discuss how the case of the wrong man serves as a basis for other Hitchcockian themes to appear, such as incompetent authority figures and police, the ordinary person in strange situations, and the MacGuffin of the microfilm and government secrets. Finally, I will discuss how North by Northwest uses this Hitchcockian device to parody previous films of the spy thriller genre while still being an exciting thriller that is still enjoyed today. This entry was posted in Student Projects on December 5, 2014 by lfremont. This 1930’s classic movie of Hitchcock’s is analyzed for its strong sexual content, profanity, and sexism. Even though this was still technically early in his career, Hitchcock was making profound statements about the ignorance of society. This paper argues that Hitchcock made statements on topics so controversial that the audience at the time was not ready to handle them, and would have been better received in a society much like today. The reason that there are so little sources on the film itself is due to the fact that nobody wanted to talk about sexism or sexuality in 1930. On top of this, the market was crashing and nobody had the money to go out to appreciate the film. The film contained the most famous motifs, such as shadows across faces, a cameo from the director himself, and a falsely accused victim. The hero of the film is much like that of The 39 Steps in the sense that the protagonist is has to go on a quest to discover a covered up truth. Hitchcock, the master of suspense, has already come into his his voice as a director and this film rings with meaning even today. This entry was posted in Student Projects on December 4, 2014 by AJ Ramos. Grace Kelly’s role in these two films from 1954 will be examined. This paper focuses on Hitchcock’s negative depiction of women in these two films regarding the Hitchcock blonde, the victimization of women with their roles in society, and romantic irony. In these two films, Kelly is placed in two very different situations. In Dial M for Murder, Margot’s husband plots to murder her, but in Rear Window, Lisa notices suspicious behavior taking place in the Thorwald’s apartment. Kelly therefore “switches places” as she reverses from a murder witness to the individual to be murdered. Both of Kelly’s characters, Lisa Fremont and Margot Wendice, will be examined and compared in both films with a larger focus on her role in Dial M for Murder. Using the analysis of Richard Allen’s analysis of Hitchcock’s films, published in 2007, the romantic irony and victimization of women will be inspected. This paper argues that Dial M for Murder and Rear Window give a negative connotation to women. This entry was posted in Student Projects on December 4, 2014 by Virginia Malloy. This piece of contemporary art is a short film in which Lewis explored rear projection, a technique in which actors stand in front of a screen onto which background footage originally shot outside is projected. The film looks as if it was shot in an outdoor ice rink, however it was actually filmed inside a theater. Hitchcock’s Saboteur (1942) seems to have influenced this piece of artwork. In this film, as in Lewis’s work, rear projection was used. In Saboteur, it was used in the scene in which Pat Lane and Barry Kane are dancing in the ball room. In both of the film and the short film, this technique wasn’t necessary; however, it was used purely for aesthetic purposes. It is beneficial because it’s used to isolate the two main characters from the rest of the crowd, putting an emphasis on their relationship. This entry was posted in Student Projects on December 4, 2014 by mmurphy4. Alfred Hitchcock’s Saboteur was one of the first films he made in America. The 1940s brought about much change for Americans with the onset of World War II in 1939 and America’s entrance into the war following the bombing of Pearl Harbor. This paper argues that in this film, Hitchcock attempts to endorse the Allied war effort in America through the use of propaganda; he does this specifically through the themes, motifs, characterization, and the plot, which are examined in this paper. Gustianis and DeSilva’s analysis of the importance of narrative films to the history of war propaganda serves as a good starting point for my paper; they argue that narrative films are just as important, if not more important than documentaries. The paper examines how important the plot was in drawing its’ audiences in and how it enabled them to root for the protagonist and against the saboteurs. In conclusion, this paper argues that Hitchcock took advantage of Americans being drawn to films like Saboteur during this period and his incentives for making it were a mix of him wanting personal success and attempting to pull Americans into the war. Released in 1959, North by Northwest is a film about an advertising executive, Roger Thornhill (played by Cary Grant), who is mistaken for a U.S. spy. This causes him to nearly be killed on a number of occasions by enemy spies led by Phillip Vandamm (James Mason). This paper discusses the theatrical themes found in North by Northwest, especially the “play within a play” motif. This paper also explores the importance of Cary Grant as its star. It discusses the true identity of George Kaplan, the spy Thornhill is mistaken for. Importantly, this paper also discusses the host of roles Thornhill assumes in his attempt to survive, clear his name, and save the spy he has fallen for, Eve Kendall (played by Eva Marie Saint). This paper cites the work of scholars such as Stanley Cavell and Robin Wood, whose textbooks are used in this class, as well as other Hitchcock analyzers like Leslie Brill and Richard Allen. North by Northwest, containing famous scenes such as the “crop duster sequence” and the “Mount Rushmore descent,” is considered one of Hitchcock’s greatest films, and this paper offers a view as to what makes it so great. This entry was posted in Student Projects on December 4, 2014 by ktlambert. 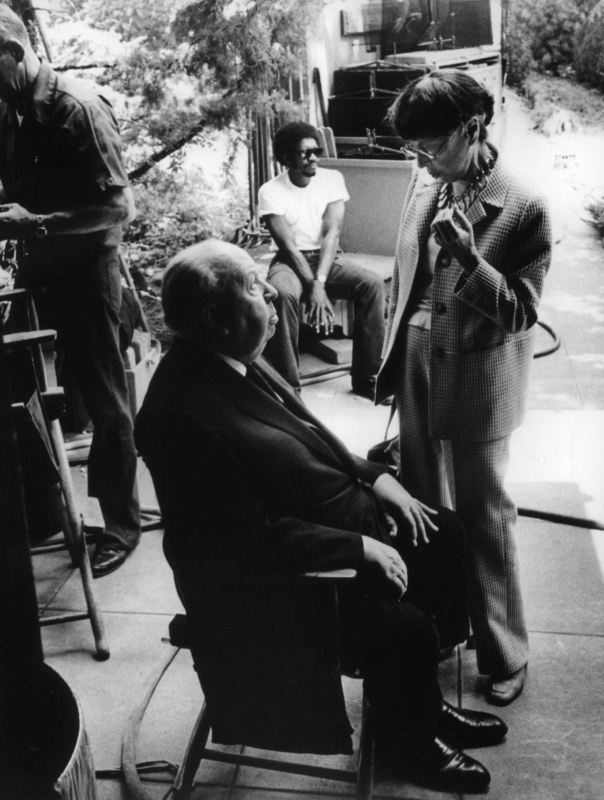 The paper focuses largely on Hitchcock’s editing style, particularly on his skillful camera movements and integration of shots and cuts. This paper argues that these elements stimulate the suspense throughout the film, making it one of Hitchcock’s cinematic masterpieces. A small portion of the paper will deal with suspense films in a general aspect as well as dealing with the elements that make up the genre and how it triggers people to feel such anxieties. Several references to critics are integrated as well as their input on the relationship between the director and suspense. There are several important scenes and sequences that are worth discussing. However the paper is limited to examining only three essential sequences. These scenes include the key retrieval, poisoning of Alicia, and descent down the stairs (final scene). Not only are these sequences filled with a variety of unique editing techniques, it also creates substantial suspense within the context of the plot. The paper will go into a shot by shot analysis of each sequence, allowing it to get the most out of the film. This entry was posted in Student Projects on December 3, 2014 by Cynthia.